Let’s face it; algae, specifically microalgae, have a bad reputation. Think of the names we call them…pond scum, slime, harmful algal blooms. But did you know that humans could not live on this planet if it weren’t for microalgae and their ancestors, cyanobacteria? For simplicity, when we say “microalgae” we include cyanobacteria, which are prokaryotes, along with modern microalgae, which are eukaryotes. Get that? Maybe not…”prokaryotes” are microscopic single-celled organisms that have neither a distinct nucleus with a membrane nor other specialized organelles. Prokaryotes include the bacteria and cyanobacteria. Eukaryotes are organisms consisting of a cell or cells in which the genetic material is DNA in the form of chromosomes contained within a distinct nucleus. Eukaryotes include all living organisms besides the prokaryotes. Cyanobacteria were the first living organisms on Earth that could perform photosynthesis. Then through a process of endosymbiosis, another larger non-photosynthetic cell engulfed a cyanobacterium intending to eat it for food but decided instead to let the cyanobacterium live inside of itself. This way the cyanobacterium was protected from being eaten and the larger non-photosynthesizer had a little photosynthetic factory inside it and didn’t need to keep hunting for food. 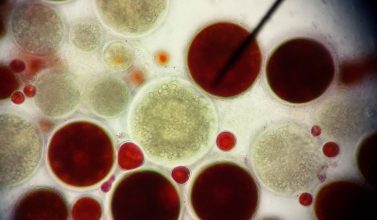 This new entity comprising a larger non-photosynthetic cell containing a smaller photosynthetic cell became the first microalgae. That was primary endosymbiosis. We could stop there, but there was actually a secondary endosymbiotic event where the microalgae was engulfed by yet another larger organism…leading to the formation of the first plant cells. In another blog post we’ll get into some of the amazing things these microorganisms did for the planet. I’m betting that you won’t believe the things that you are about to learn. Stay tuned! OMG! Its unbelievable and amazing. Enjoy learning about the history and science about how the algal cells came to be. Very interesting!! Thank you for sharing your knowledge Mr. Ramjohn. Knowledge IS power, and this is powerful. Knowledge is meant to be shared and its my privilege. Learning about microalgae and all its benefits to earth and health is fascinating.